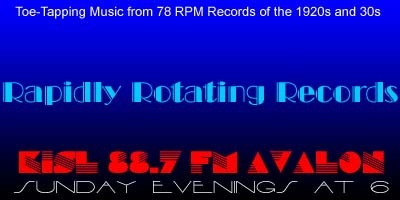 Welcome to Rapidly Rotating Records, bringing you vintage music to which you can’t *not* tap your toes, from rapidly rotating 78RPM records of the 1920s and’30s. On this week’s edition of the show, we’re going to whoop it up, burn things up, hear the latest buzz, and after not having any birthday celebrations for several weeks, we’ll observe the natal anniversaries of Bernice Petkere and Al Goodman. Per usual, there are at least a couple of records making their RRR debut. If you enjoy the show, please let us know by leaving a comment on the website or the Facebook page or sending an email. And remember, your requests and topic segments are always welcome. RRR is also available as a podcast on iTunes. Simply enter Rapidly Rotating Records in the iTunes search box and a link to the show will appear. Our iTunes ID has changed, and is now https://itunes.apple.com/us/podcast/rapidly-rotating-records/id1166703514. Unfortunately, with the change, we lost all of the comments and ratings for the podcast. If you use iTunes, please subscribe to the podcast and leave a rating and comment. THANK YOU! We are proud and happy to announce that Rapidly Rotating Records is now being rebroadcast by Global Community Radio and can be heard over WRST 90.3 Oshkosh, Wisconsin, the broadcast service of the University of Wisconsin. We’re heard on WRST’s internet stream on Saturdays at 8:00 AM (Eastern). We’re also now heard on WXDR, 98.9, in New Orleans, Louisiana. WXDR, known on the air as Dolphin Radio, is the student station at Delgado Community College at 7:00 AM (Central). The Rapidly Rotating Records telephone request line is now OPEN! In addition to sending cards or letters, sending email, or posting to the the show’s website or facebook page, you can now call in to request a particular artist, song or topic segment, leave feedback about the show, or ask questions or comment about the music. Of course, I’d be happy if you just call in to say “Hi!” and let me know you’re out there listening. The easy-to-remember number is 234-PLAY 78s or 234-752-9787. My River Home – Chick Bullock and His Levee Loungers / Chick Bullock, v.
Lullaby Of The Leaves – Adrian Schubert AHO / Harold Von Emburgh, v.
Hats Off, Here Comes A Lady – Ted Weems AHO / Parker Gibbs, v.
And finally, please consider becoming a member of KISL. A basic membership is just $20 and a premium membership is $50. While most of you are not on Catalina Island and can’t take advantage of the merchant discounts and offers that go with membership, you’ll be supporting community radio on Catalina Island and beyond. I am not paid for the show, nor is it underwritten. I do the show because I love the music and the people, stories and culture behind it. Visit http://www.kislavalon.com/membership. Thanks!